This decision was passed unanimously. After listening to the decision rationale presented by Councillors and the Director of Planning, residents, “battered and dismayed” by a poorly handled amendment process (refer earlier posting – Planning and Governance), are now also “reeling”. They are seriously questioning Councillors understanding of planning issues and the relevance of overlay concepts being presented in the current of major activity centre review to significant developments in the yet to be reviewed Neighbourhood Activity centres. Glen Eira’s current Planning Scheme review was directed by the Minister for Planning. Council’s requested extension for an exemption from community consultation was replaced with a requirement for Council to undertake a review of it’s planning scheme. The review goal being to bring the GE’s Planning Scheme into line with contemporary planning principles, concepts and tools (eg. structure planning and overlays). 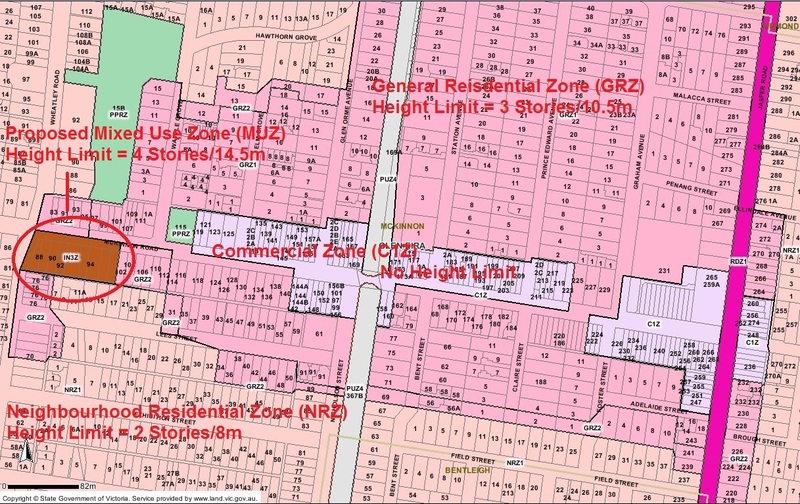 The major impact of the 2013 Zone Implementation was the introduction of height controls for 3 of the residential zones. Other aspects of development (eg. built form, siting, neighbourhood characteristics, parking etc) largely remained unchanged in existing policies and strategies. Included in the Zone Implementation was a discussion paper which recognised that Council’s policies and strategies were not effective. when it came to the re-zoning of 88-100 McKinnon discussion comments inexplicably reverted to the current planning scheme and it’s provisions. No mention was made of strategy, how best to achieve these visions (as per the Concept Plans) nor was any mention made of the impact a site of this size (3,691 sqm) and location (extreme western edge of the activity centre) could have on achieving on these visions. Re-zoning for residential development is better than re- development as industrial – possibly, however, no proposal was put forward for redevelopment as an industrial site – the pro’s and con’s are unknown. The resident requests for a DDO and NCO are not necessary. Existing controls in the Planning Scheme and ResCode are sufficient to preserve and protect neighbourhood amenity and character. Council’s existing Activity Centre and Housing Diversity Strategies do not include statements on Neighbourhood Character other than to say it is “emerging”. The Concept Plan documentation recommends the use of overlays to describe preferred character, development scale, design requirements and setbacks. The GRZ is working, the additional controls of DDO and NCO are not required. The stated intention of the GRZ is to provide “diversity of housing that is consistent with existing neighbourhood character.” Neither diversity of housing type (ie. townhouse vs. multi-unit dwellings or single, couple, family accommodations) is occurring nor are features consistent with existing neighbourhood character being incorporated. The zone is not working, why not capitalise on that work undertaken for the major activity centres by applying it to proximate Neighbourhood Centres when re-zoning opportunities arise, particularly when those with sensitive interfaces/issues. the achievement of desired outcomes and streamlines the permit approval process. Costly – expenditure of residents funds to ensure planning scheme contains appropriate controls (eg. overlays that are in line with the zone’s intention, the newly approved strategy and the community’s views) is fundamental to Council’s role as the Local Planning Authority. Risky – no detailed explanation was provided. Comments of overlays being “not binding” left residents wondering. DDO’s are recommended, by an independent consultant, in the Concept Plans. Restarting/delaying the process – no explanation was provided as to why a restart would be required. Residents also do not believe that avoiding further delay justifies excluding the proposed of overlays. They also point to 3 months attributable to Council’s decision to request Planning Panel review. Council’s consultative process had been beyond the legal requirements … the next step in the process is to forward the amendment to the Minister for approval. Council consulted with residents on the initial MUZ and DDO proposal – a consultation that was later described as “testing the waters”. Council’s proposal to rezone site as GRZ2 was not discussed with residents prior to the Council Meeting of 21/3/2017. At this same meeting Council’s decision to abandon the MUZ and DDO was, by virtue of the inclusion of referral to a Planning Panel, meant that the MUZ and DDO remained on the table for Panel’s review and that residents only consultation on GRZ2 was with the Panel and not Council – Panel Hearing rules restricted questioning of presenters to Panel Members. Residents were also made, that Council had been advised by the Minister’s Office, that since GRZ2 was considered a more restrictive rezoning, further community consultation was not required. Council has yet to consult with residents on the General Residential Zone and consultation is unlikely to occur. While satisfying the planning laws consultation requirements, resident believe it falls short of the representative and consultative obligations outlined in the Local Government Act and Council’s proclamations of being representative and actively encouraging community engagement. Council apologised for initial communications which lacked transparency and showed a need for improvement. Overall it was a good process and resident participation showed that the process worked. Residents were thanked for their participation and encouraged to continue to engage with Council. Hence the earlier comments that residents are now reeling and questioning. non transparent selection of available options within the Planning Law. While GERA has shown, and will show, support for Council initiatives and community engagements, GERA does so on a case by case basis. In this case GERA’s assessment agrees with that of the resident’s. 14/11/2016 – Amendment Exhibited. The developer initiated proposal related to rezoning industrial land to an inappropriate zone (MUZ) and an inappropriate DDO height limit (4 stories). The proposal included misleading statements and was inconsistent with both the Planning Scheme and contemporary planning concepts. 180+ planning objections were lodged – over 90% requesting that the amendment be abandoned and residents be allowed input into the rezoning decision. 23/2/17 – Planning Conference attended by 30+ objectors arguing for abandonment of the proposal and input into the re-zoning decision. Since GRZ rezoning was seen as “more restrictive” there was no legal requirement to undertake community consultation before applying the zoning. 25/5/2017 Planning Panel Hearing – 11 attendees). Initial MUZ and DDO amendment inappropriately described “testing the waters” and Council endorsed the GRZ rezoning. 20/6/17 Planning Panel Report and recommendation for GRZ2 rezoning made available to residents. refer the General Residential Zone (Schedule 2) and an Environmental Audit Overlay to an independent panel in accordance with Section 23 of the Planning and Environment Act 1987. This change to the proposed zoning, while not acceding to residents request for input into determining the most appropriate zoning (General Residential – 3 stories vs Neighbourhood Residential – 2 astories), does show that Council has acknowledged the concerns expressed by residents. GERA congratulates both the residents and Council on the decision to abandon the proposed Mixed Use zoning and 4 storey height limit. In particular, GERA acknowledges Cr. Hyams for his comments on the assistance GERA gave to residents opposing the proposal and for acknowledging the validity of the planning arguments presented, by incorporating them in his reasoning for voting to abandon the original amendment. the presented proposal was both inappropriate and unacceptable and that Council should abandon/reject the current proposal pending completion of a detailed analysis and the presentation of that analysis to the community via consultation. if necessary, considering a third party assessment. We accept that committing to above will add a further delay to the lengthy planning scheme amendment approval process (which, incidentally, is not subject to the 60 day time limit applicable to large planning permit applications), however, we contend that compared to lasting impact of unacceptable and inappropriate development such delay is minimal. For those interested, background on this Amendment and proposed DDO is available in our previous posting Save McKinnon Village. Chair: Cr. Jamie Hyams, with Jacqui Brasher, Principal Strategic Planner, in attendance. The planning conference proved to be a marathon event lasting almost 4 hours with the approx. 30 attendees raising strong objections to the proposal itself and equally strong criticisms of Council for presenting residents with the developer’s proposed zoning, heights and setbacks, without Council (the responsible Local Planning Authority) presenting to residents any analysis of available options. Their overwhelming opinion was that the presented proposal was unacceptable and should be rejected by Council. Council should consult with community to obtain their input on the most appropriate zoning, height and setbacks for the site. Attendance Requirements – Council advised that the change in attendance requirements (i.e. pre-registration) and the police presence at the Conference, were precautionary measures undertaken in response to the developer (a well known local resident) receiving threatening and intimidating letters re the development proposal. Fortunately, nothing untoward occurred and many of the objectors, prefaced their opposition to the proposal, with well wishes for the developer as he embarked on his next endeavour. Generally, when it comes to planning matters, there are two types of community consultations. These being amendments to the planning scheme and an application for a planning permit. Amendments – basically the Planning Scheme defines what (ie. physical parameters) can be built where and the nature of the uses (ie. businesses) that are allowed in the various locations. The current proposal fits into this category and, it is at this stage that community involvement is emphasized – it’s when the parameters are set for building heights, footprints and setbacks etc. Although Ministerial approval is required before an amendment is effected (formal term = gazetted), Council as the Local Planning Authority is responsible for preparing and substantiating the proposed amendment – provided appropriate documentation is presented, Ministerial Approval is generally given. VCAT has no involvement in this approval process. Planning Permit Applications are the next level down from the Planning Scheme Amendments – these are applications (which include detailed building plans) to develop a site in accordance with the parameters/clauses incorporated in the Planning Scheme (ie. predefined maximum heights, building footprints and set backs etc). VCAT is the arbiter in this approval process. With regards this current proposal, as the proposed Amendment and DDO is yet to be defined, detailed development plans are yet to be prepared. Roadworks – Residents requested information on the proposed roadworks on the Cnr. Wheatley and McKinnon Roads (the tender notice appeared in the Age 21/1/2017). Since such roadworks would impact the traffic and parking conditions around the site, residents had sought (6/2/2017 & 20/2/2017), but had yet to receive information on the proposed roadworks. The details of the roadworks provided by Cr. Hyams were that they involved raising the height of the current roundabout (to ensure motorists drove around, rather than across, the roundabout) and for associated road re-surfacing and kerb replacement. No comment was made on the delay in passing this information on to residents. Conference – As previously mentioned the Planning Conference was well conducted/facilitated. All attendees were given adequate opportunity to express their views (some more than once) on the proposal and their dissatisfaction with Council’s poor planning performance and the quality of information re the proposal that had presented to residents. Cr. Hyams confirmed that the proposed Mixed Use Zone, building heights and setback requirements originated with the developer, as is his right. Please note that the maximum leasable floor area for MUZ allowed uses (ie. no planning permit required) is capped at 150 sqm. However, Council advised that area can accommodate sit in/take out stores, cafes and restaurants. Additionally, although not specifically mentioned, planning permit applications can be lodged to expand areas beyond the 150 sqm cap. Contrary to information contained in the Explanatory Note, the site is not “surrounded by residential and commercial uses” . It is a stand alone site on the boundary of McKinnon Village that is surrounded by residential zones only. As previously mentioned the MUZ features lower requirements for permeability, landscaping, private open space and setback requirements than those of surrounding GRZ and NRZ zones. Setback requirements and landscaping being “hot” issues as the location is prone to storm water flooding and providing the transition from growth areas to the NRZ areas. McKinnon Village currently has many vacant shops. The recently completed grade separation works had added more vacant shops and more will be added as already approved multi-unit developments are completed. McKinnon doesn’t need additional shops, particularly shops located away from the village core. As the Mixed Use Zone has no height limits or set back requirements DDO6 defines a 4 storey (13.5-14.5m depending on land slope) height limit and rear setbacks for the site. Is inconsistent with the concept of scaling down building heights from the Village centre towards the Neighbourhood Residential Zone. The site is subject to a special building overlay (SBO). An SBO is related to requirements for storm water flooding treatments, it is not and should not be a justification for a height increase of an additional storey. Like wise, describing a proposed building as a “Gateway” is not a justification for increased height that is inconsistent with the surrounding zones. A Gateway building is more appropriately located on the Jasper Road (a main road) entrance to the village rather than that village’s boundary with the NRZ. Will result in visual bulk, dominance and overshadowing. With regards visual bulk, residents highlighted the dominance of the only 4 storey building within Village (diagonally opposite the new train station) . The dominance of this building when viewed from across the road or when approaching along McKinnon Road indicates how dominant a 4 storey building, surrounded by 3 and 2 storey buildings, will be. restricts ground absorption of storm water runoff (a Special Building Overlay applies to the site). Surrounding topography and inadequate Council maintenance of drains within the Village frequently resulted in storm water flooding of the immediate and surrounding areas. restricts on-site landscaping opportunities (eg mature vegetation) that would mitigate visual bulk and provide a positive amenity impact for future residents. In response to questioning on above ground side and street front setbacks the Developer’s Representative indicated that diagrams of proposed setbacks had been forwarded to Council. The diagrams, distributed to objectors the next day, are flagged as being indicative only – this combined with the absence of such setback requirements in DDO6 raises serious questions re the inclusion of side and street-front setbacks if the current proposal is accepted by Council. Additionally, the Developer’s Representative was unable advise if side and street-front setbacks would be included at ground level or commence at a higher level. Already congested McKinnon Road is becoming even more congested (despite removal of the level crossing). The intersection with Wheatley Road (the only local road that links North and Centre Roads) is becoming increasingly dangerous. The proposal would increase traffic volumes on both roads. Wheatley Road services schools and significant redevelopments within the Ormond, McKinnong and Bentleigh centres. The road is narrow and experiences high parking demand that requires regular “crossover pullovers” by current traffic. On Street parking (on both McKinnon and Wheatley Roads) within the vicinity of the proposal is minimal (due to the roundabout slipways, bus stops and crossovers) and is simply incapable of providing for the extra demand that will generated by a Mixed Use Zone. Proposed development vehicle access via a one-car width laneway accessed from Wheatley Road is inadequate. This precedent doesn’t currently exist, don’t let it be created. Apologies for the length of this posting folks – it’s a challenge to summarize 4 hours – thanks for hanging in there. GERA has recently been asked by some McKinnon Residents to assist them in reviewing a proposed Planning Scheme Amendment (C143) and Design and Development Overlay – Schedule 6 (DDO6) for a large development site located on the south and western edge of McKinnon Village Neighbourhood Centre. While the residents accept that their Village area will change, they do not believe that the currently proposed Mix Use Zoning is appropriate for the stand alone site. The residents are seeking community support in objecting to the proposed Amendment and DDO. – the objection due date is 23/12/2016. Check out their website – Save McKinnon Village. 88-100 McKinnon Road, McKinnon. Located on the corner of Wheatley and McKinnon Roads. A Special Building Overlay (ie. area prone storm water run-off and flooding) is applicable to site. Current site zoning is Industrial (INZ3), which prohibits residential development. A narrow right of way (laneway) exists at the rear of the site. Proposed Mixed Use Zone (MUZ) which allows commercial, retail, industrial and residential usage as a right (ie. no planning permit required, therefore, no third party objection rights). “Allowed as a right usages” include businesses with extended trading hours (eg. Convenience Mini-Marts and Takeouts, Food and Drink services). No side or street front setbacks at ground level or as building height increases. surrounded by residential zones (GRZ and NRZ) with limited on street parking surrounding the site due to road configuration. There are no Neighbourhood Character requirements specified in the Amendment or DDO or Glen Eira’s Housing Diversity Policy. There should be as McKinnon Village has a distinct and unique character. Council has advised that a Planning Conference will be scheduled in the New Year and that Council will decide on the proposed Amendment and DDO at it’s February Council Meeting. In the intervening period the objection due date is 23/12/2016 and there’s the busy Christmas/New Year holiday period to consider – timing doesn’t favour the residents. GERA encourages our members and readers to submit an objection to the proposal – numbers count!!!. A sample objection letter is available on the Save McKinnon Village website.